The holiday weekend before Christmas on the sports channels of the A1 will be marked by hot soccer derbies from Spain and Italy. Saturday`s Day will offer fans of Serie A the direct broadcast of five fights of the XVII Round. The start of the marathon is at 13:30 with the collision between Lazio and Cagliari, which will be broadcast directly on the MAX Sport 3 air. From 16:00 Milan host Fiorentina, and the match is also MAX Sport 3. On the sametime, but on MAX Sport 1, the Battle between Napoli and JPA starts. From 19:00 the Chievo team, the only Serie A team to have no victory since the start of the championship, will have a very tough test;home against Inter, who will defend their position in the Top 3. It is time for the big derby of the round between Juventus and Roma. The Turin hosts have 15 wins in their first 16 championship games, but over the years the wolves have always given serious resistance to the old lady. 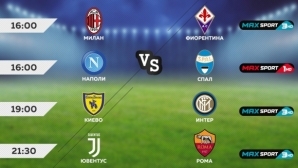 The matches Kiev;Inter and Juventus -;Roma will be able to track directly on MAX Sport 3. The latest matches for the 2018 calendar year in the Spanish La Liga also promise a lot of fans` emotions. On Saturday, leaders in the standings Barcelona and Atletico Madrid have easy home games. The Matches meet at 17:15 Espanyol at Wanda Metropolitan, while Lionel Messi and the company play at Camp Nou against Celta at 19:30. In the late game at 21:45 hours, the rugged Athletic Bilbao team will be pursuing the vital 3 points against Valladolid`s hard-line survival. The three games of the weekend of Primera will be broadcast live on MAX Sport 2. The calendar year in Spanish football will be closed on Sunday with the last two games of the 17th round. From 17:15 Leganes welcomes Sevilla, and from 19:30 Raio Vallecano hosts the Levante, with the two crashes being transmitted directly to MAX Sport 2.